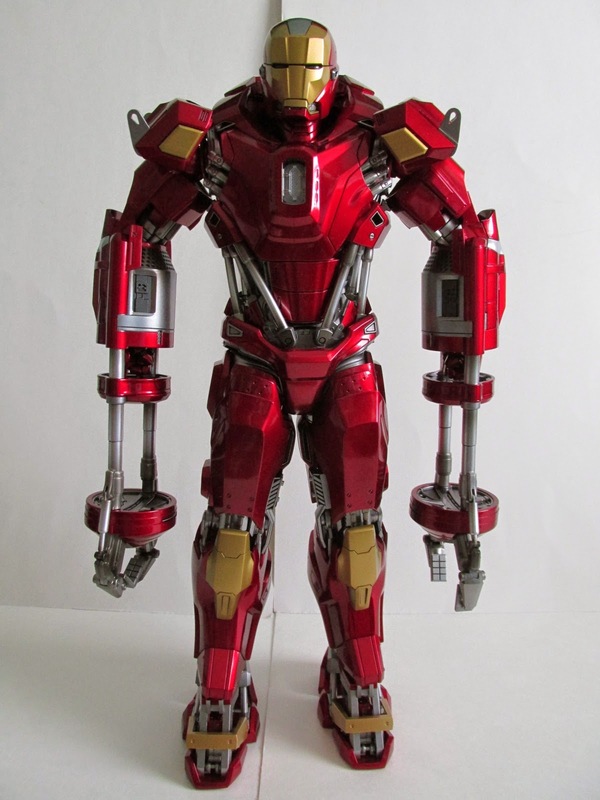 It's never too late to look at an older toy, and today I'm looking Hot Toy's Iron Man 3 Red Snapper Power Pose figure. 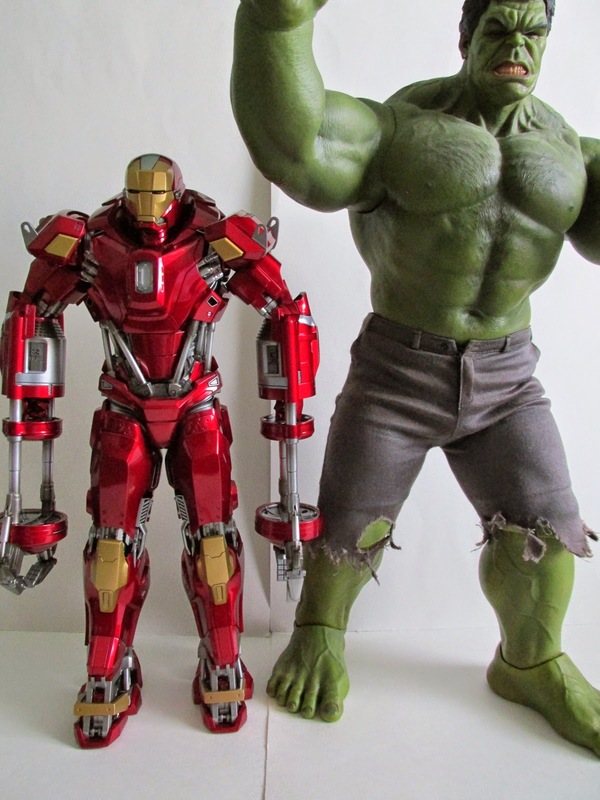 Power Pose is an new line from Hot Toys, and it pretty much means figures in these series will have limited to no movement because of their fixed poses. This sounds like quite a setback, but I guess it just depends on what the figure is and how it works. In this case, the Red Snapper fits this limited movement figure line mostly because of its sheer size, but overall it is not a disappointment. 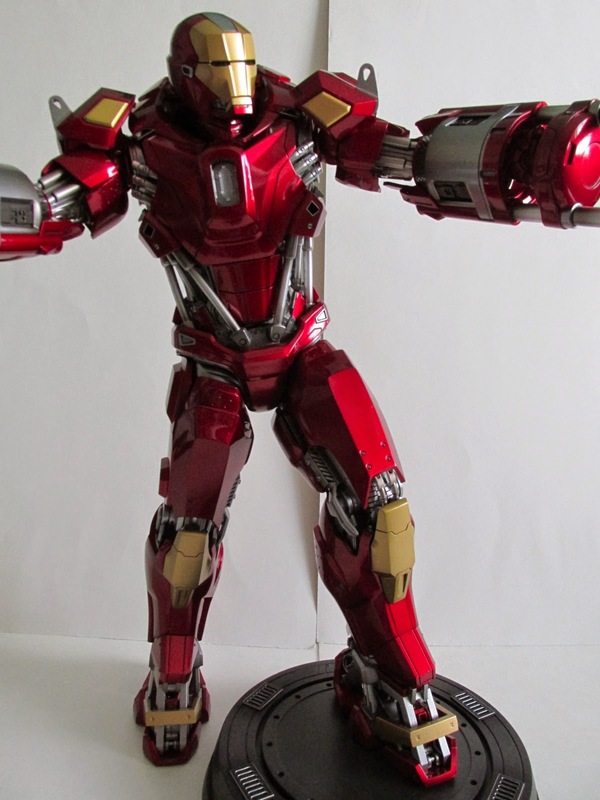 The craftsmanship on this figure is pretty extraordinary and can draw a lot of attention to your collection. 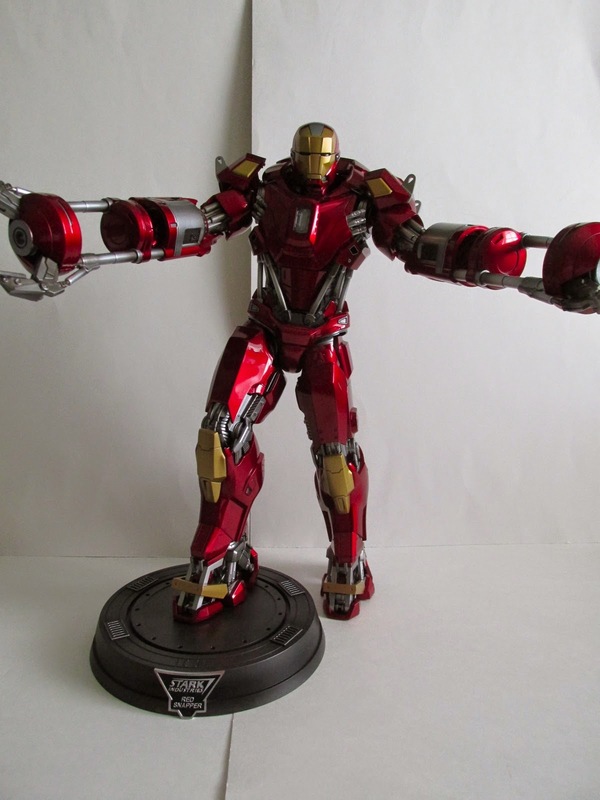 The arms are huge and is just one of the wow factors this figure has. Only the arms, head, and legs can move. The rest of the body is in a static pose and cannot be moved. If you look closely, the torso is slightly turned to face the left and so cannot be repositioned. The limbs have limited movement mostly because of how wide the arms and legs are. Even if this was a regular Hot Toy, there really isn't much articulation you can get out of it. Also his claws can move...still not that amazing but better than nothing. He comes with a small stand for hovering poses and just one base. I'm liking the simple base design and its faceplate. 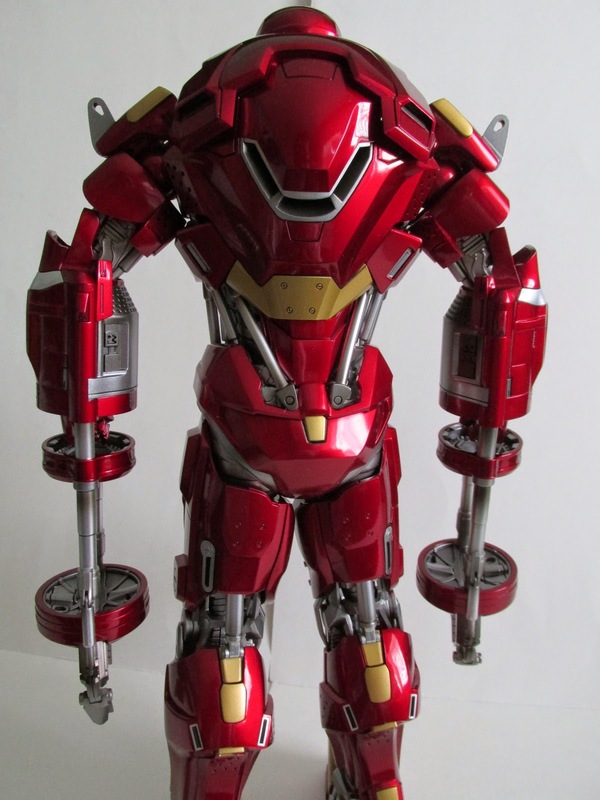 I wish Hot Toys would adapt that for their bases for the Iron Man line rather than the standard ones we have been getting. Don't wait! Sideshow Collectibles has a great deal on him. See here! 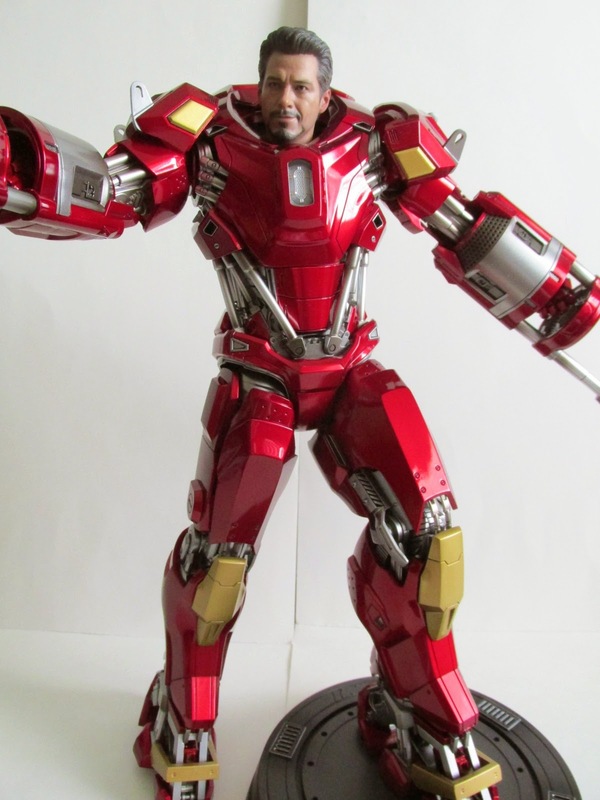 The other display option you can do is switch out the helmet with the Mark VII Tony Stark head. A nice touch, but I probably won't display him like that. 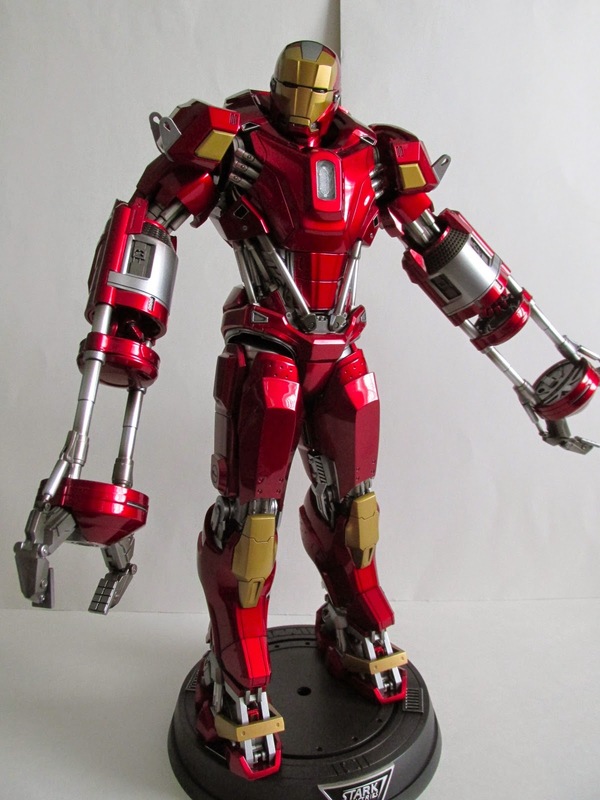 You can also take his arms and put them on some other Iron Man figure, but I don't have him and the arms seem too delicate to mess with. Overall, I do like this figure and pleased with the results. It took me awhile to jump on getting this, but with the sale at Sideshow I couldn't resist. 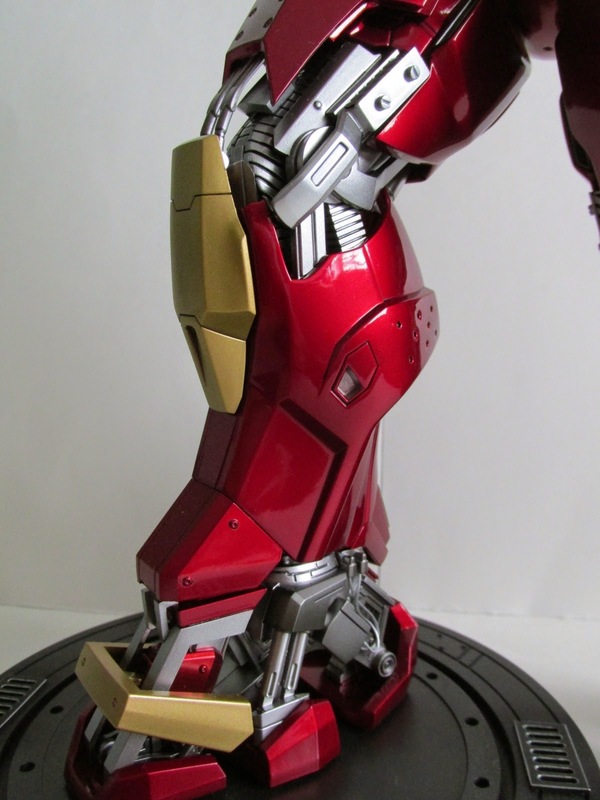 Iron Man fans don't need convincing to buy this, but if you are on the fence just know that this is more of a statue like collectible rather than a 1/6th scale Hot Toy.